All solid-state THz frequency multipliers based on GaAs Schottky diodes, which have advantages of wideband, high efficiency and stabilized continuous wave output, are still the most workable solution for THz local oscillators, such as ALMA, Herschel and JUICE-SWI. 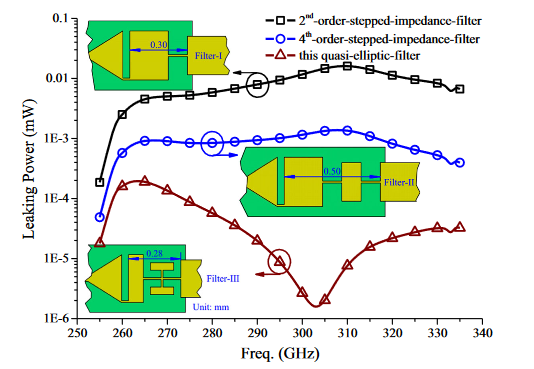 Researchers led by Prof. Sheng-Cai Shi, Purple Mountain Observatory and Associate Prof. Alain Maestrini, Université Pierre et Marie Curie in Paris (UPMC) & Observatory of Paris, are developing a high efficiency and wideband 300 GHz frequency doubler based on six Schottky diodes. This balanced doubler features a compact and robust circuit on a 5-µm-thick, 0.36-mm-wide and 1-mm-long GaAs membrane, fabricated by LERMA-C2N Schottky process. An improvement of factor of 2 in operational bandwidth has been achieved, with no penalty in efficiency with regards to state-of-art Schottky doublers in WR-3.4 band. This doubler pumped with 20–60 mW Pin has performed high efficiency of better than 16% cover wideband of 266–336 GHz (FBW of 24%), a peak output power of 14.75 mW at 332 GHz with a 61.18 mW Pin, an excellent peak efficiency of 30.5% at 314 GHz with 43.86 mW Pin and several frequency points with outstanding efficiency of higher than 25% are delivered. This doubler can serve as the second stage of the 600 GHz frequency multiplier chain and fulfill the requirements for next generation THz detection instruments. This research work by Jiangqiao Ding et al., has been published in J Infrared Milli Terahz Waves (2017) 38:1331–1341.For more details please see: https://link.springer.com/article/10.1007/s10762-017-0413-y.